Here are a couple stories of one local family’s efforts to manage oceanfront condominiums on Kure Beach and Carolina Beach. It’s all about keeping guests and owners happy. Meet your A1 Property Management team: David, Sue, Chelsea, Kayla, AJ and Lori. For those of you who don’t know us we are David and Sue Paul, the owners of A1 Property Management. With our two daughters, Chelsea and Kayla, Kayla's boyfriend AJ and David's sister Lori, we manage short term vacation rentals in Carolina Beach and Kure Beach. As most of our clients don’t live in the area they rely on us to be their eyes and ears. They count on our family team to maintain and rent their vacation properties, and we take that responsibility very seriously. It keeps us busy twelve months a year and we love it! Our team is in this business because we believe in providing the highest level of customer service to all our property owners and guests who rent their properties. We treat all of the oceanfront vacation condos we manage as if they were our own. Our owners may only come here once or twice a year but that doesn't mean we only work hard just before they arrive. We strive to continually provide the best rental experiences to all out guests. During the summer, with so many guests checking in and out, my team and I are constantly evaluating our properties, and it’s not just a quick two-minute review either. We are always looking for and finding surprises that require our time and attention. For instance, guests like to feel at home when they’re here in Kure Beach or Carolina Beach on vacation and it’s amazing how many of them will rearrange the furniture. Too funny! We always put it back the way it was and straighten up behind them. We think most people would also be shocked at how much renters leave behind, especially items in the fridge. Our daughter Kayla, who works with me cleaning and restocking our properties, is always finding cans of soda, ice cream, frozen food, shampoo, and clothing. This summer one renter even left their iPhone behind! We tried to call them but of course the number we had for them was for that phone. Luckily they discovered it missing and came back about 30 minutes later. Property Management is an area that requires constant attention. This summer a guest called to say that there was water dripping down from the ceiling in the hall bathroom. David ran over immediately and found that the A/C unit above my condo was leaking. Our HVAC man, Tyndall, came over and quickly repaired the leak. Luckily, since we took care of it immediately, it didn't cause much damage to the ceiling. We're glad our renters called us right away. Another time, one Saturday this past summer, while doing our morning rounds of property inspections after guests check out, we discovered that it was very warm in one oceanfront condo. Sometimes renters turn the thermostat up so we weren't too surprised but after about a half an hour it was only getting warmer. We again called Tyndall and he came right over. He got it fixed and the condominium cooled down before the next guests checked in. These are just a few examples of what we do here at A1 Property Management. We have a high level of attention to detail on each and every property we manage and try our best to get issues resolved quickly before renters arrive. That’s not to say that we've never have problems mid-week during a renters stay but most renters understand and are great to work with. Respond to the issue right away, keep people informed, get the problem resolved, and then follow up to make sure they are happy. When it comes to “eyes and ears” we have a whole team of people who care about the properties we manage and don’t walk past items that need attention. Whether it’s David, Sue, one of our daughters, Chelsea, and Kayla, AJ or Lori, we all work together to make sure that everything is in tip top shape, all the time. Working with property owners and making sure their vacation condos in Kure Beach or vacation condos in Carolina Beach are always clean and properly maintained is only half of our business. Getting their properties rented is the other half. We've had excellent success finding renters and that’s due to a great sales and marketing team. Our daughter Chelsea manages our various websites and social media sites as we strive to keep our renters informed of changes and new properties as they arise. She loves the marketing side of the business and we're grateful, that’s for sure. Because Pleasure Island has fantastic beaches, a fun boardwalk area, two fishing piers, the NC Aquarium and historic Fort Fisher, finding vacation guests for the summertime isn’t extremely difficult. Families love our island and our vacation rentals are typically booked solid all summer long. In the off season it takes a bit more effort to keep our properties rented but we’ve been very successful, especially in the “shoulder seasons” of April/May and September/October. We are proud to announce that we recently made an investment when we purchased a first class online reservation management system from LiveRez. This integrated, cloud-based solution offers on-line booking and payments. It is tops in the industry and we believe it will help us market and rent our properties even better. If you're reading this, you're on our new website now! 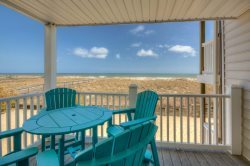 Checkout our inventory of oceanfront vacation rentals including homes and condos along Carolina Beach and Kure Beach. Lori helps renters make their reservations and answers their questions and with this software, it really makes it easy on everybody. "Your Property Manager, circa 1963." If you’d like to learn more about our team at A1 Property Management and how we can work together to manage your investment property, please give us a call. We'll be glad to sit down with you and discuss how we can offer you exceptional service at competitive prices.